I have a freezer full of frozen raspberries, thanks to the $1 sale at Dillon’s. The kids love to have their own blended drinks when we are hanging out at the pool. I don’t where they get the idea that they need a frosty “beach” type drink when we are hanging out at the pool…certainly not from ME! This drink just came together on a whim, and it turned out pretty tasty. You can use just about any kind of frozen fruit. 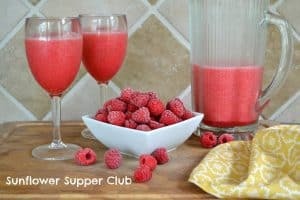 Pour lemonade concentrate into blender and the add frozen raspberries, water and ice. Blend. Pour over ice and enjoy. If it's too sweet pour into a glass with some lemon-lime drink to blend. Add a little rum or vodka and make it even better! Oh yeh! PERFECT! Definitely my kind of yum. Oh those lucky kids of yours ;-} Your frozen berries in the photo look sooo inviting!